Dr Ahmad, Malaysia “Typhonium Plus® is a complementary treatments for cancer. What exactly is Typhonium Plus®? 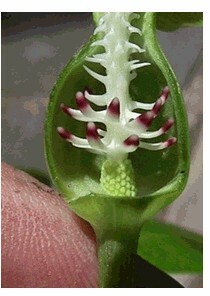 Typhonium flagelliforme / Keladi Tikus is a herbal plant that is native to East Asia. It has long been considered a health supplement that complements a number of traditional and alternative cancer therapies. Typhonium Plus® combines a number of selective herb extracts that in a powerful formula that strengthens the good work done by Typhonium flagelliforme. How Is The Body Affected By Typhonium Plus®? The combination of Typhonium flagelliforme extract and certain other herbs aid in detoxifying the blood system. Other ingredients found in Typhonium Plus® include anti curcumin, anti-oxidant and ribosome in acting protein. The joint effect of all these active ingredients is the potential production of mediators that strengthen and stimulate cells in the immune system. Those cells are then in perfect position to go and fight off the cancerous cells. It is already known that the growth of cancerous cell can be reversed, which makes this process seem all the more plausible. Typhonium Plus® was first released in 2003 and has gone on to help thousands of cancer patients from all over the world. It is most commonly used in the U.S., Netherland, Spain, Belgium, United Kingdom, East Europe, South America, Middle East, Africa, Australia, Malaysia, Singapore, Brunei, Japan, Taiwan and Hong Kong. A good number of the patients that used Typhonium Plus® have gone on to praise the efficacy of the product. The positive feedback they gave ranged from a lessening in pain, all the way up to the side effects of cancer treatments being greatly lessened. There were others who spoke of how their recovery times were improved. Even terminal cancer patients felt that their quality of life improved when taking Typhonium Plus®, giving them a little extra time to spend with their loved ones. Typhonium Plus® is not just for cancer patients, though, with healthy individuals also seeing benefits. Many of those people are exposed to elements that increase their risk of cancer, or have hereditary issues that may make them more predisposed to the disease. Taking Typhonium Plus® helps boost the immune system so that the body is better prepared to fight off potential cancerous cells. You agree that by using this website you are assuming all risk. Neither we, nor our affiliates, nor any of our officers, directors, or employees, makes any warranty as to the results that may be obtained from the use of the website, or as to the accuracy, reliability, or currency of any information, content, service, or merchandise provided through this website. All of the information contained within these pages, including information about products, treatments, health and medical conditions is for information purposes only. You should always listen to any and all advice or recommendations given by your attending physician or medical professional first. This product should not be considered a substitute for any professional medical advice you receive. 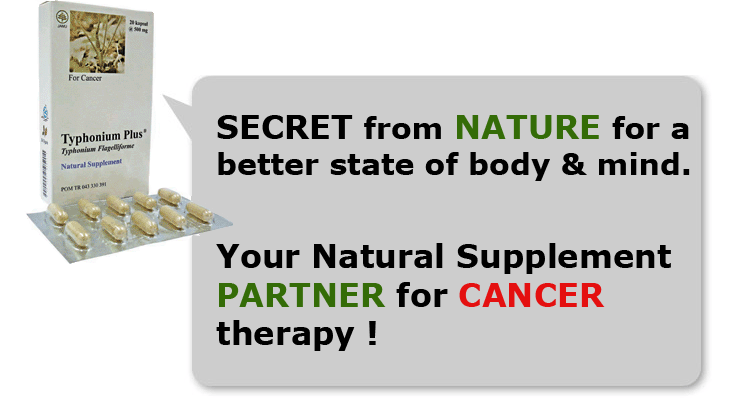 We provide no guarantee that this product will cure you of your existing cancer or tumors. Experiences of users past and present showed that this particular herbal combination did provide relief and support healing. Full healing comes from a combination of professional medical help, a healthy lifestyle that is stress free, and a healthy balanced diet. Peace of mind, a strong faith and other factors are also important.